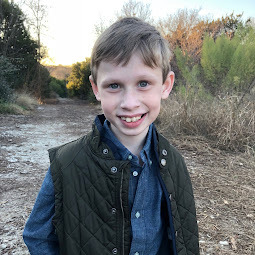 In the last blog post, I shared about how Bennett is now using an AffloVest, a new portable vest technology that helps Bennett treat his CF while also living more life (aka not having to be "plugged" in to the wall twice daily). In this blog post, I wanted to share about a new portable compressor we have been using called an eRapid. 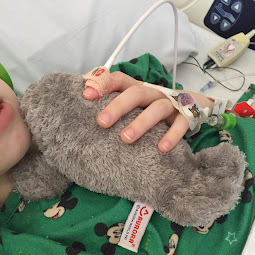 Most all CF patients must inhale medications through a machine called a compressor. (Many asthmatics also use a compressor.) A compressor is a machine that aerates inhaled medications. 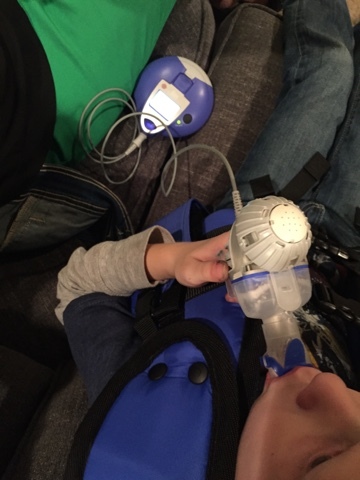 Most standard air compressors work like our plug-in Pari Vios: they have a motor and forces air through a plastic tube connected to a nebulizer cup filled with the liquid medication. The compressor works to turn the liquid medication into a mist in which the patient can inhale deep in to their lungs. Many pediatric CF patients use a mask to breathe in this medication through their nose and mouth. Adult CF patients typically prefer using a mouth piece so they can take deeper breathes of the inhaled medication and move away the nebulizer cup from their mouths when they cough. While these air compressors are great, they often take a long time to aerate the medications - often 10-15 minutes per med. If you have 3 meds to take twice daily, that's potentially over 1.5 hours a day inhaling medication. 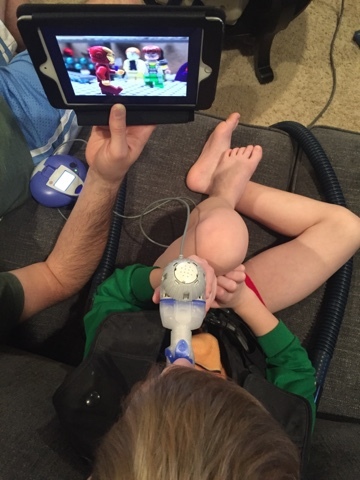 Thankfully, in the last few years, more and more companies have started coming out with a new electronic compressors that work differently than just forcing air through a plastic tube to the nebulizer cup. One of these new compressor is called the Pari eRapid. It an electronic portable compressor (much like the Trio and Altera) that uses electricity and a mesh that acts as a micropump to create the aerosol. The eRapid is just that - it is SO fast! This baby can dispense meds in less than 2 minutes! That saves us SO much time! In addition, we love that the eRapid is portable. It runs on batteries so it can be done in the car, while walking around or out in the woods. It's SO nice (even though we have still tended to sit in the same place on the couch to do his meds - old habits are hard to change)! 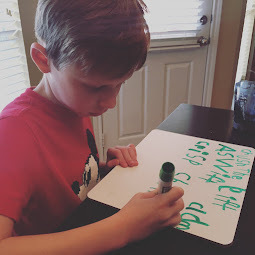 So, here's how the eRapid works: First, you must put all of your pieces together (which can first feel a little daunting but turns out to be pretty easy). 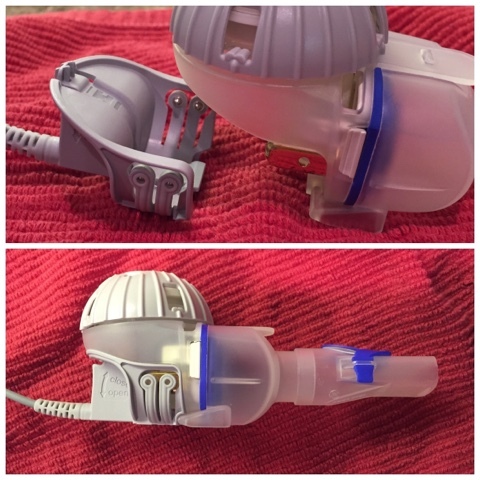 The parts include (starting clockwise from the top piece): the medicine reservoir, the mouth piece, the aerosal head, the medication cap and the inhalation valve. Secondly, after putting those pieces together, you hook it up to the eBase. See the plug prongs in the top of the picture above? You just slip the eBase plug onto those prongs to create an electrical current. Thirdly, you place the medication in the nebulizer cup (see the eRapid telling me to remember to do so?) and turn on. The medicine will begin to aerating immediately. 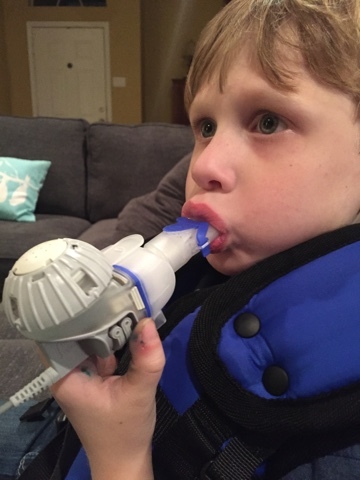 The eRapid should run for only the amount of time necessary to aerate the medicine (there is often residue medicine in the bottom of the nebulizer cup but it's because the eRapid uses only what is necessary, no more). 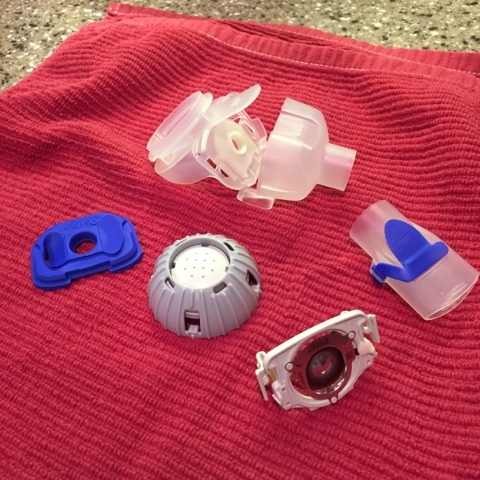 To clean, directions suggest that taking apart the nebulizer cup pieces and soaking them in dish soap for 5 minutes. Then they must be rinsed and sterilized. Again, I was first intimidated by this process but I realized it's not much different than the way we typically do it. 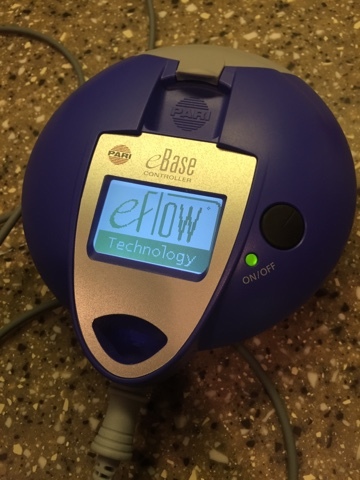 One very common problem we have had with our eRapid and have heard others have had as well is that the eBase "medicine-done" sensor works only 50% of the time. The eRapid aerates the medication for the lungs quickly and efficiently. This part is always working correctly. But, after the medication is appropriately aerated, it is supposed to provide a signal via the eBase that it is done. The problem is that the eBase doesn't always signal that it's done when it's done. Instead the base stays on but the mist stops flowing. When I called Pari about this, I was told this was a typical problem they know about and that the "work around" is to simply turn off the machine when the mist stops. I would hope that Pari would be trying to improve this feature of their product but the man who answered the phone said he didn't know if that was happening. After thinking more about this problem, I realized that our air compressor works similarly - we turn it off when we hear/see the mist has stopped flowing. There is no indicator. 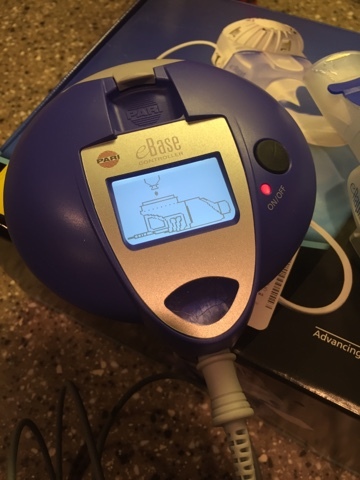 So, while I wish Pari would just take off the eBase notification (since they know is doesn't work), it isn't much different than what we already do - listen/watch and turn off when the medication is done. Despite this known issue, we still like the eRapid. It is smaller, quieter and more portable than our air compressor, which is wonderful - especially when traveling. It's worth noting that the eRapid is expensive and can't be purchased without first qualifying as using an eligible medication. 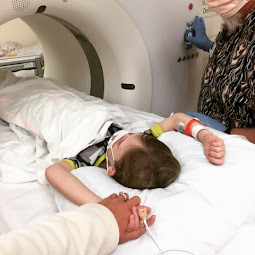 Since Bennett is on Pulmozyme daily, we qualified for it and were able to get insurance coverage. We are thankful to IV Solutions of Lubbock for all of their help to get the eRapid's approval. But I am hopeful that as new technology becomes available and as patients ask for things that improve their quality of life, items like the eRapid and Afflovest will become more easily available to everyone. Hi! Quick question...can you use all of Bennett's medications in this machine? (We use ipratropium-bromide/ hyper-Sal/ Pulmozyne). THANKS!! The 2 gallon compressor is usually designed to be helpful and operate a minimum of one serious tool. As such, many folks see them as a superb compromise between the small twelve potential unit compressors that area unit too weak to power something and also the larger vi gallon compressors that area unit in all probability too powerful for many people's family applications. though once more there's many selection, one will typically expect to pay regarding $150 to $250 for a brand new two gallon mechanical device, tho' clearly used and refurbished units can value less.